What are Spidey and Sir Hope-a-Lot planning? Spider-Man has a new sidekick: The president-elect. 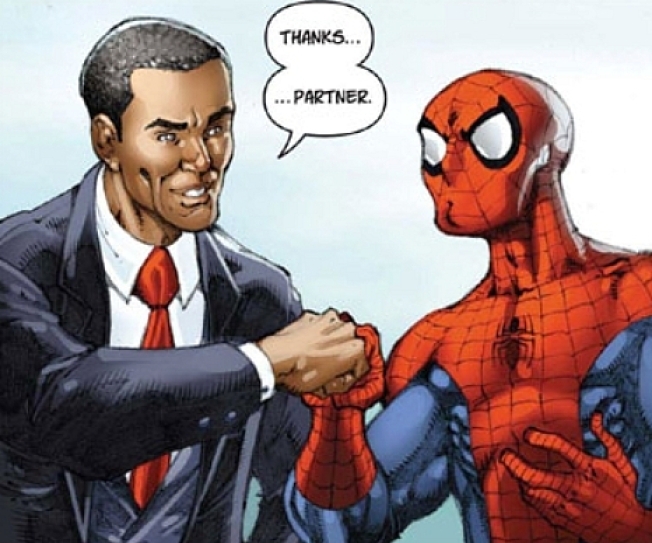 Barack Obama collected Spider-Man comics as a child, so Marvel Comics wanted to give him a "shout-out back" by featuring him in a bonus story, said Joe Quesada, Marvel's editor-in-chief. "How great is that? The commander in chief to be is actually a nerd in chief," Quesada said. "It was really, really cool to see that we had a geek in the White House. We're all thrilled with that." The comic starts with Spider-Man's alter-ego Peter Parker taking photographs at the inauguration, before spotting two identical Obamas. Parker decides "the future president's gonna need Spider-Man," and springs into action, using basketball to determine the real Obama and punching out the impostor. Obama thanks him with a fist-bump. When Obama made the same gesture during a campaign event last summer with his wife Michelle, alarmist pundit E.D. Hill of Fox News suggested that it was possibly a "terrorist fist jab." The following week, Hill offered an apology. Marvel comics have featured most presidents, but generally in walk-on roles, Quesada said. "I think President Nixon might have appeared on the cover, but not in a good way," he said. Obama has said that as a child, he collected Spider-Man and Conan the Barbarian comic books. His Senate Web site used to have a photo of him posing in front of a Superman statue. The Obama story is a bonus in Marvel Comic's Amazing Spider-Man #583, available in comic book shops nationwide on Jan. 14 for $3.99 and is expected to sell out, with half the covers devoted to Obama.